The British Gazette » Not the Pink Panther. The Almighty’s words (above) clearly have not registered on some currently unknown person. 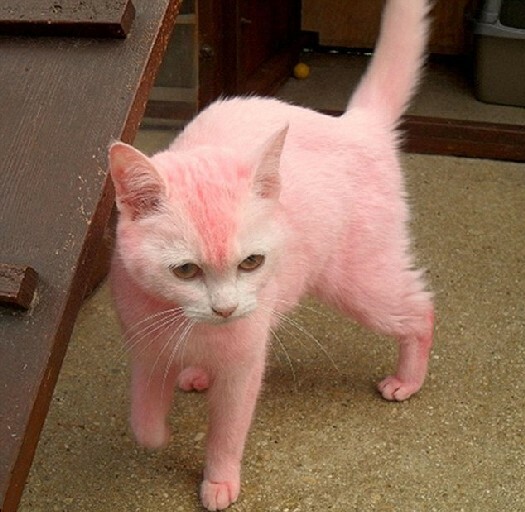 For although the Lord created a white cat, this person thought they could improve upon His work by dying the unfortunate creature pink! The cat was discovered by a lady in Swindon in the county of Wiltshire in the “wee small hours.” Her husband had come home very late having been drinking with friends. Upon entering his residence from the rear a cat landed upon the ground nearby – having been thrown over this gentleman’s fence. When told that a pink cat was in the backyard the lady assumed it to be the drink talking. But no. The cat, now named Pink by the animal shelter caring for her, is doing well. What puzzles staff at the Cheldene Veterinary Centre is that Pink is very healthy and very friendly. “Pink has been dyed very evenly and the person has taken care to ensure it did not get in her eyes or mouth so I think it may have been done professionally.” stated Vet Penny Gillespie. The vet reports that the dye job was done with care and it looked as though until recently Pink was wearing a collar, as there is a white band around her neck that has not been coloured. The dye cannot be washed out but the vet reports that it should grow out in about eighteen months. The RSPCA are still asking the public to help them find the person who discarded Pink, who will be found a new home. In the British Gazette’s opinion there is likely to be more than one person involved. Pink clearly has been a well cared for cat. The fact that the creature is friendly is almost certain proof that the animal has not been ill-treated by its previous owner – animals obtained from rescue centres often have behavioural problems associated with earlier abuse. Why then may the reader ask should a caring owner wish to be rid of this pet? Consider the facts we know: the animal was dyed pink. What sort of person possesses pink objects? A female person is the obvious answer. The person who dyed the cat pink is therefore more than likely to be a woman – and a young woman. It is possible that the hair dye she used was something she had herself used on her own hair. One sees from time to time young women with unusual hairstyles and colourings. Go to a large university campus and observe for oneself if you doubt this. It is quite possible that this young woman’s action was objected to by a boyfriend or brother who felt that having a pink puss in the household did not project a macho image. Well it doesn’t does it? He may well have persuaded the young woman to part with the creature or he may have taken the matter into is own hands regardless and disposed of the animal the way he did. It is likely – if the youth has any sense – that he and the young woman may live a considerable distance away as cats are known to be able to find their way back to their territory. This may be the reason why he dumped the animal in the back yard of the Swindon couple – to be sure that someone would find it and take it to a rescue centre. We therefore have to ask ourselves this: Is this a case worthy of prosecution? The British Gazette’s answer to this is no. Whilst we do not condone what was done – and indeed deprecate these actions, the young woman who did this to the cat clearly took care to avoid the dye entering the eyes and nostrils of the animal. She did not want to cause it to suffer. Presumably she took steps (by fitting a veterinary funnel collar) to ensure the cat did not attempt to groom itself whilst the dye was setting. Sadly however the animal rights fanatics running the RSPCA are likely to have a different view. They are in fact likely to contact the police and ask them to review CCTV camera footage in the area to try and ascertain the identity of the culprits. The British Gazette earnestly hopes that the Wiltshire police decline the RSPCA’s request as it has more important tasks to fulfil. If the RSPCA does find the culprits, the British Gazette has little doubt about the outcome. They will be prosecuted by the RSPCA in the Magistrates’ court and these latter day Gauleiters will impose the politically correct severe punishment upon this couple. This of course will give them criminal records, cause them to loose their jobs and will also make insurance very expensive to obtain. In short the couple’s actions will have seriously messed up their lives. I stopped donating to the RSPCA a few years ago, immediately after the last foot and mouth outbreak. Daily, reports complaints were made about the inhumane methods, DEFRA’s cattle slayers were employing. Clubbing animals to death, shooting them and failing to kill them outright etc. The RSPCA received literally hundreds of complaints, many of them backed by reports, accompanied by film and photographic evidence supplied by the media. DEFRA, facing the humiliating prospect of being taken to court by the RSPCA, charged with animal cruelty, struck a deal. In The Government would bestow upon the RSPCA greater powers, and make the selling of a goldfish to anyone below the age of sixteen, a criminal offence. Needless to say, at the same time the Government was proposing giving sixteen-year-old’s the right to vote. The RSPCA has been hijacked by the left wing lunatics of the animal rights brigade, not to be confused with animal welfare charities. If a pensioner, whose sole income is the State Pension, but owns their home and so does not qualify for other benefits, the RSPCA will charge them a hundred pounds plus, just for an appointment for emergency treatment for their pet, plus charges for the actual treatment. While around her, those on state benefits parade their pedigree dogs which receive treatment FOC.